We try hard not to judge new technology, even if it is supremely creepy. After all, a need for weird things must exist somewhere – that’s why those weird things were invented, right? 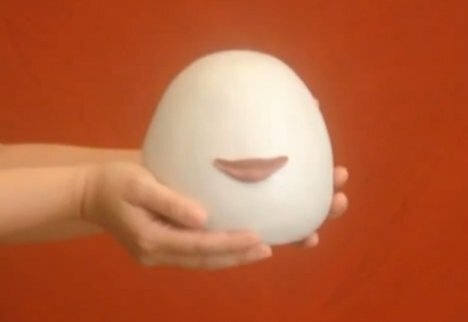 But it is just about impossible to avoid laughing out loud at this little robot egg with lips, and then getting really creeped out by it. It is called Kissenger (alternately: Kiss ME), and it is meant to transmit the kiss of one lover to another when their bodies are separated. Looking a lot like a Mrs. Potato Head with a lot of her parts missing, the Kissenger is outfitted with a pair of very sensitive robotic lips. When one partner kisses her device, the signature pressure patterns are recorded, transmitted via internet, and delivered to the other partner’s egghead. According to Lovotics, the company behind the unusual intimacy-building robot, this technology could open the door for lots of other romantic options between humans, robots, and virtual characters. See more in Robotics or under Technology. July, 2012.